Not everyone will recognize that headline and its awkward punctuation. It's a play off of the headline for Apple's full page ad in the Wall Street Journal when IBM announced the IBM PC in 1981 (disclosure: the ad also ran in the publication I ran at the time). To the competitors already in the mirrorless market, Canon's entry will feel a lot like the personal computer industry did when the big player decided to come try to dominate the game everyone else was already in. The EOS M tells us that Canon isn't going to ignore the fastest growing segment—maybe the only growing segment—of the camera marketplace. But it also tells us something else. The three big players in cameras are Canon, Sony, and Nikon, in that order (counting all cameras they make). 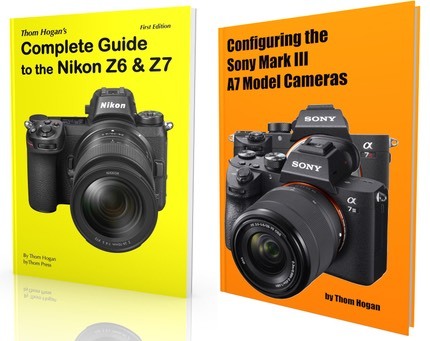 It's interesting to see that all three have picked broad strategies that try to mesh a full line up of cameras, while the others all seem to be much more selective and niche in approach. Canon: compact, large sensor compact, large sensor mirrorless, crop sensor DSLR, full sensor DSLR. Nikon: compact, high end compact, small sensor mirrorless, crop sensor DSLR, full sensor DSLR. Sony: compact, large sensor compact, large sensor mirrorless, crop sensor DSLR, full sensor DSLR (re-entry coming). Fujifilm: compact, high-end compact, large sensor mirrorless. Olympus: high-end compact, crop sensor mirrorless, (maybe crop sensor DSLR?). Panasonic: compact, high-end compact, crop sensor mirrorless. Samsung: compact, high-end compact, large sensor mirrorless. We also have one competitor who appears to be aiming like the Big Three (Pentax), but who is struggling to get volume at any of their competitive points. But it isn't just the breadth of choices across all cameras that Canon, Nikon, and Sony are pursuing. We're also seeing them trying to shore up breadth in each of their sub-categories. This will become most obvious in the next couple of months as Canon and Nikon round out their full sensor DSLR lines with entry models and Sony re-enters that market, but I think it will become obvious throughout their lineups within the next six to twelve months. The next year will be the defining moment for everyone's digital camera divisions. Almost no one predicts overall market growth in the next five years, though quite a few predict that specific categories of cameras will prosper, most notably mirrorless. The Big Three cannot allow another company to get full traction in mirrorless because of that flat overall market, as it would eventually distort the overall market shares away from them. The Sub Three players are looking to find a category they can defend and eventually expand against the Big Three. This is, of course, good news for those interested in mirrorless cameras. Competition—especially the heated competition we're about to get—will only make the products better and the choices wider. In the next months we're going to get significant new announcements from Canon, Fujifilm, Nikon, Olympus, Panasonic, and probably Pentax. Even Leica isn't sitting tight. And that's just cameras. Lenses, too, will play an important role in coming months as players try to round out options that make sense for their market position. So Canon's entry should be seriously welcomed by photographers. We now have all the players with toes in the water and the full swim competition is about to begin in earnest.